Wichita doesn’t need to ruin a park for economic development, as there are other areas that would work and need development. 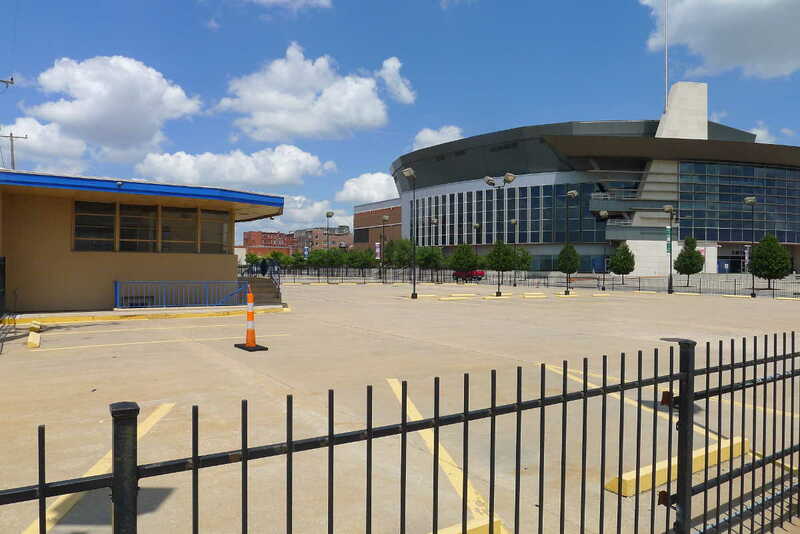 In other documents city officials have promoted the need for gathering space before and after events at Intrust Bank Arena. All this is fine. But current plans call for the destruction of an existing park and its transformation into this new design. But there’s no need to destroy an existing park in order to meet the goals of the city. 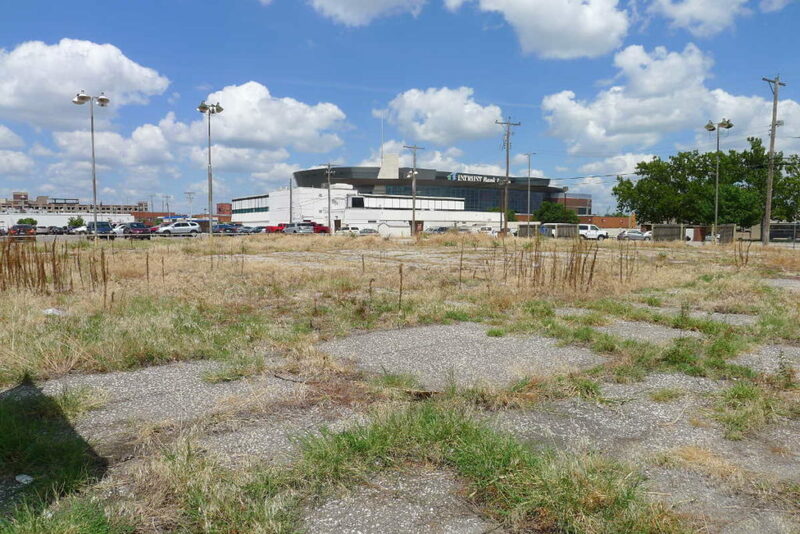 There is a lot of vacant and underutilized land immediately south and west of the arena. Any of this could be transformed to what the city wants. Development of these areas would possibly help fulfill the promise of the arena as a driver for economic development and growth. Today, 12 years after the identification of the arena’s site and seven years after its opening, there is little activity around the arena to its west and south. 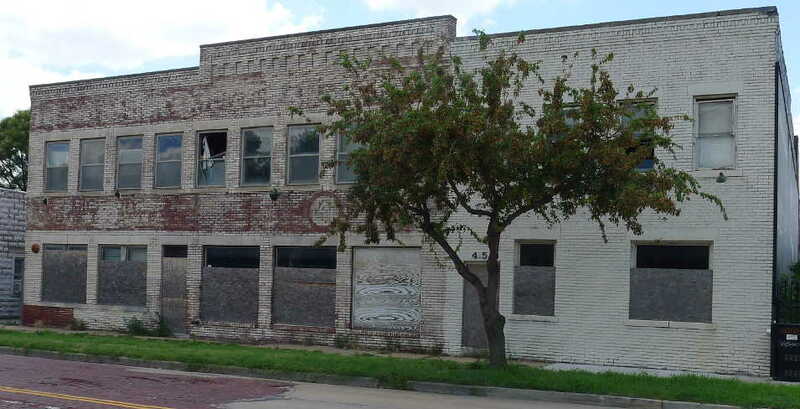 Five years ago the Wichita Eagle noted the lack of growth in the area. On the other hand, the area around Naftzger Park is developing. The city points to Old Town as a success, and now promotes the “Douglas Corridor” as an area where city policies have produced growth, with more yet to come as Cargill and a call center move to a location near Naftzger Park. But the areas on the other side of the arena are not growing. 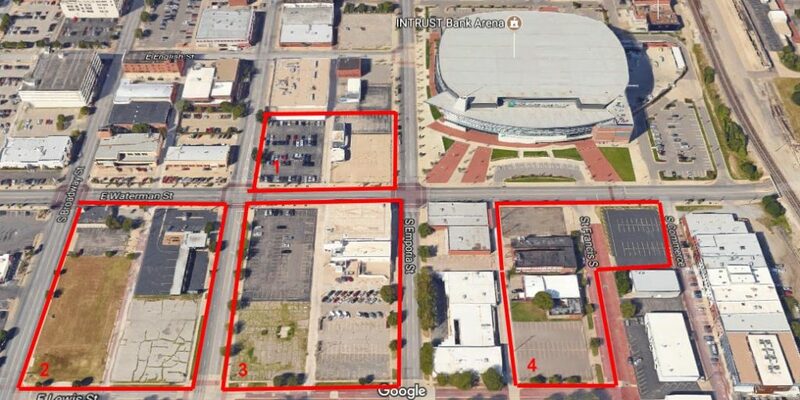 Doing something to jump-start development in that stagnant area could help downtown growth. Paying attention to that area would fulfill past promises and projections, and increase the credibility of Wichita’s leaders. Nearby are photographs of the area surrounding the arena to the east and west. Click photos for larger versions. Intrust Bank Arena and environs, with areas for development outlined and numbered. Image courtesy Google. 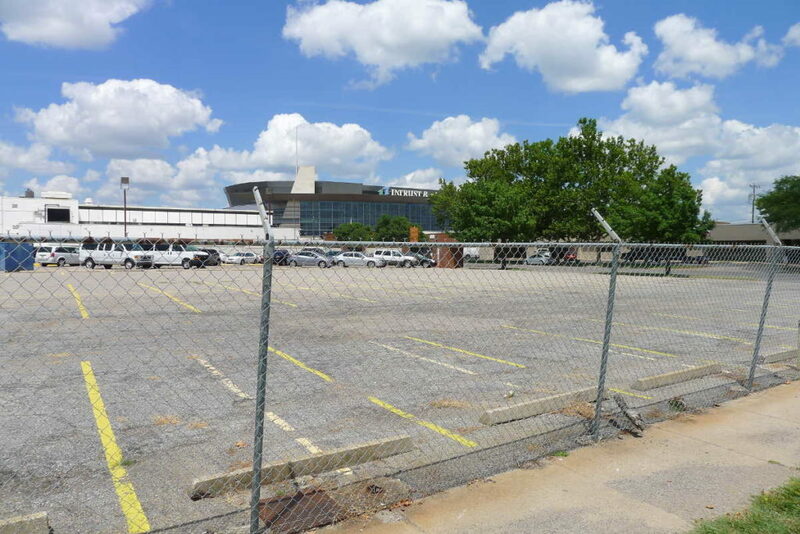 In area 1, across Emporia Street from the arena, a former used car lot is unused. A vacant lot is to its immediate west. Area 3 is the block diagonally south and west from the arena. It is vacant land except for parking and a work-release facility. Area 4 is directly across Waterman Street to the south of the arena. It holds a parking lot along with abandoned and underutilized buildings. Abandoned buildings on St. Francis Street, within pitching distance of the arena. Could this area be used for gatherings? Following, a few quotes from civic leaders in 2005. Imagine sports fans and concertgoers flocking to restaurants and shops in a lively, distinctive district surrounding Wichita’s new downtown entertainment arena. Can the 15,000-seat venue be the Pied Piper of economic development? City officials hope so. “It will have a profound change,” Wichita Mayor Carlos Mayans said. He envisions a modern, sophisticated district, home to a four-star hotel, apartment buildings, high-end retailers, a Cajun restaurant – maybe a Hard Rock Cafe. “The things happening downtown are going to change downtown Wichita for the 21st century,” he said. The most exciting development: a new downtown arena. Whatever the final site selection (we vote for the east site), the reality is sinking in that this major community project will have a heavyweight impact on the core area. The naysayers said none of this could happen — in fact, they said the same thing about Old Town. It’s happening. Things change — and sometimes change is disruptive and hard to accept. But Wichitans should be excited by what’s happening downtown. I would like to congratulate the city leaders and the public for their insight and willingness to see the impact that the development of downtown will have for the citizens of Wichita and all of south-central Kansas. We only stand to benefit from this much-needed injection into the economy. It is about re-energizing this community, spurring economic development, creating jobs, quality of life, encouraging tourism from around the region, and bringing money into our community. The WaterWalk development and the downtown arena are only the beginning of the potential for downtown to flourish and continue to fuel other economic development. Wichita has an opportunity to become a viable destination stop. And these projects can help support many of the other amenities already available in the city, such as the museums along the river, the ice center, Old Town and so many other businesses and attractions. 10 Richard L. Taylor of Wichita is business manager for the Building and Construction Trades Council of Central and Western Kansas. Previous PostNaftzger Park concerts and parties?Next PostNaftzger Park contract: Who is in control?